They say the Danes are the jolliest people in Scandinavia, but the Norwegians would argue they are. And they could be right. They can appear somber on the street, but get them into a social situation and it’s all smiles and laughter. The Norwegians know how to enjoy life and it shows in Oslo, a city of nature and museums on Norway’s southern coast. It is also the largest city and capital of this Nordic country. One note: Oslo is one of the most expensive cities in the world (for instance, a pint of Haagen Dazs is $10), so spend wisely and frugally to make your money last. This is a good time to take out the Oslo travel guide that you bought before leaving (you'll pay through the nose if you wait to buy one in Oslo); scan it now for ideas. While you’re deciding how to spend your time in Oslo and the environs, just walk around the city streets a little. You’ll find Oslo is full of sidewalk cafes with people chatting (even if it drizzles), charming traditional architecture, and extremely livable neighborhoods that are full of trees and flowers in summer and become a wonderland of snow and well-plowed streets in winter. With a city population of only 634,293 and roughly a million in the metropolitan region, it never seems crowded; in fact, take a walk on side streets and you'll only see a few other people, if any, walking there, too. If you need directions, try asking for help in English; most Norwegians speak some English and many speak it quite well. Stop in one of the small, local restaurants like highly rated Grådi in the Tøyen neighborhood, not far from Sentrum (the center of Oslo), where you’ll find a selection of satisfying Norwegian comfort food. While in Oslo, if you can, make it your mission to find a place serving über-fresh Norwegian salmon, which is traditionally poached in a big pot of salty water that flavors the fish. And stop at a green market to buy some Nordic berries, all kinds of berries, like cloudberries and gooseberries, that we rarely, if ever, see in the United States. Keep in mind that this is a global city with eclectic food as well from Syria, Vietnam, the American South, and other far-flung locales, so there is plenty of culinary variety. Oslo is endowed with ​incredible natural riches. Not far from the city center, there are many, many parks where you’ll find rivers, forests, lakes, and the Oslofjord with islands and beaches. On one of the cherished sunny days here, you’ll see Oslo residents out drinking in the rays at the parks and even on sidewalk benches. There are, in fact, a great many nature lovers in Oslo—and Norway, for that matter—whose idea of a good time is to pull on their hiking boots and head to the mountains for a two-week walk among the glaciers, which are capped in the last of the summer's snow and ice. At night, hikers generally camp out or stay in one of the country’s convenient mountain cabins with affordable accommodation and big, communal tables where hikers chow down on wholesome, filling food after a day on the trails. For hikers, these walks are an opportunity to stay fit, be in nature and sun, enjoy themselves with a community of other hikers, and just relax. A word to the wise: If you decide to go hiking in the mountains, bring sunscreen. The mountains are generally closer to the sun than the cities, so you will need it. If you have one day in Oslo, you can still see the top sights and attractions in Norway's capital. You'll just have to prioritize a little and select things that fit into one day. 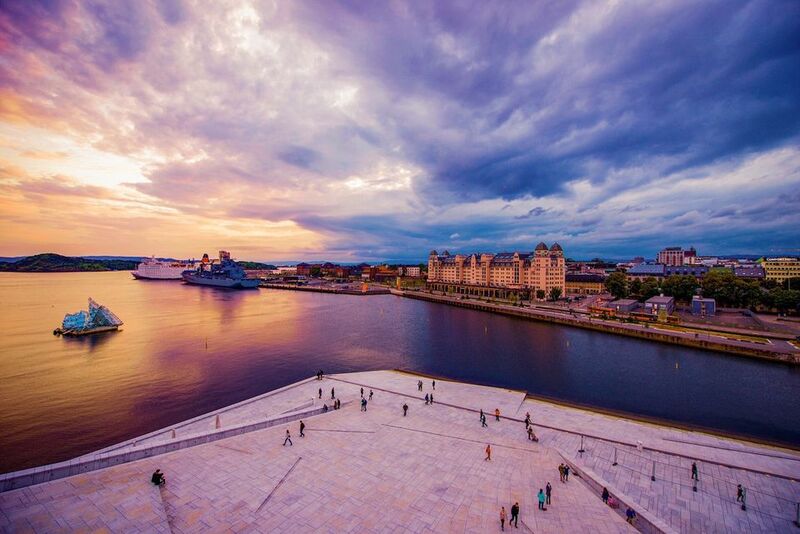 You could take a 7.5-hour guided tour of Oslo where you can visit the must-see sights by boat and bus, including Polarship Farm, Holmenkollen Ski Jump, Vigeland Park, the Viking ships, the Norwegian Folk Museum, and you'll even be able to fit in the seafood buffet that the tour company organizes. Alternative options include visiting Oslo's green parks and gardens to experience their natural beauty or shopping in Oslo for Norwegian sweaters or fashion apparel. With three days in Oslo, you'll have more flexibility. For this length of time, a great option is to visit the city of Bergen, Norway's charming second-largest city on the west coast, for a couple of days. It is known as the gateway to the fjords, so there is an abundance of natural beauty. Bergen is almost a seven-hour drive, but the trip is well worth it. In Bergen, visit fisketorget, the city's historic fish market, which has been in operation for centuries, as well as Bergen's picturesque wharf and cultural attractions. You could also drive a couple of hours north from Bergen one evening and experience the Northern Lights (Aurora Borealis). This spectacular fluorescent light show is caused by electrons streaming in toward the Earth along its magnetic field and colliding with air particles. After you've seen Bergen, it's back to Oslo, where you'll have a day to hit the highlights; one of those 7.5-hour guided tours could be a big help in this department. Here are two great options for spending seven days in the Oslo area. After you've seen the top sights in Oslo, take a relaxing driving tour to the North Cape. You'll be bowled over by the beautiful landscapes along the way since your trip will take you through six national parks. And you'll be able to touch Europe's northernmost tip—a breathtaking view. If you prefer city travel and local attractions without driving for days, combine our one-day and three-day suggestions for Oslo, adding perhaps a couple days of mountain hiking in the Oslo region and a short cruise among the fjords in the Bergen area.